DIGESTIVE SUPPORT (COOL & CALM) is Nourishing & Soothing Support for the Digestive System. The four herbs in DIGESTIVE SUPPORT (COOL & CALM) have been used for thousands of years to support & soothe digestive function. The key herb in the formula, AMLA, is well known for its antioxidant and nourishing qualities, especially for hyper acidity in the digestive system. HOW IT WORKS: Soothes the digestive system and promotes healthy digestion. 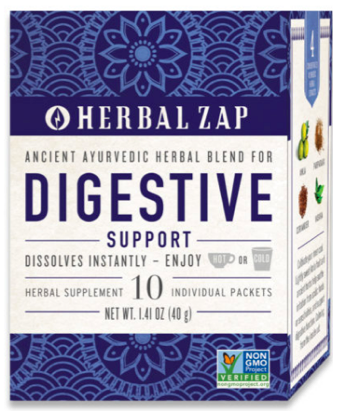 Directions: As an herbal supplement, dissolve 1 packet of Herbal ZAP in 6 oz of hot or cool water, stir, sip and enjoy! You may drink as needed.Children 3 & up: Use 1/2 packet repeat up to 4 times daily.